[monkeysinacan] wanted to add a fog machine to his Halloween display, but he says that the cheaper consumer-grade models are pretty unruly beasts. He cites short duty cycles and tricky fog control as his two biggest gripes with these sorts of foggers. He decided make the fogging process a little more manageable, and modified his to only generate fog when someone was walking nearby. One obvious concern with this sort of setup is the warm-up time required to get the device ready to produce fog. If it were to only turn on when someone walked by, [monkeysinacan] would miss his mark each and every time. To ensure that his machine was accurate, he rigged it so that the heat exchanger stayed powered on, triggering the fog juice pump as needed. To do this, he used an ultrasonic sensor similar to, but cheaper than a Parallax Ping unit. 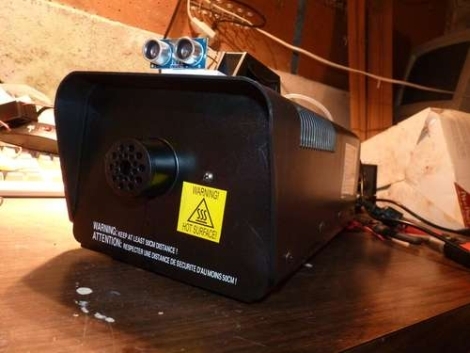 Paired with an Arduino, the sensor triggers the fog machine’s pump for 20 seconds whenever anyone gets within 6 feet of it. While he hasn’t posted video of the modified fogger at work, it sounds like a solid plan to us.